This policy brief focus on why some communities are better able to confront high rates of crime compared to others. And, given that Community Based Crime Prevention (CBCP) operates in contexts that are far from uniform, the brief also seeks to understand what can be learnt about what drives better results in communities suffering high levels of insecurity. This policy brief focus on why some communities are better able to confront high rates of crime compared to others? And given that Community Based Crime Prevention (CBCP) operates in contexts that are far from uniform, what can be learnt about what drives better results in communities suffering high levels of insecurity? The brief describes the results of a multi-country study conducted to explore the interplay between the severity of crime, levels of trust within a community, community participation rates, social ties and willingness to act, in order to understand why CBCP may be effective even in the face of severe crime. 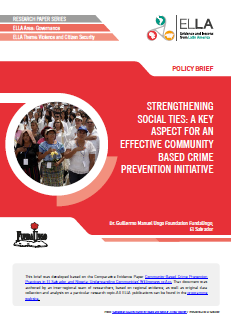 The research in which this brief is baes found that in communities where social ties are strong but trust in state crime prevention institutions is low, community-led crime prevention initiatives may be effective in addressing the problem of crime. On the other hand, in communities where the level of trust in state crime prevention institutions is high and the levels of social ties are weak, state-led crime prevention initiatives may provide a better option. The study concludes that efforts aimed at improving CBCP in El Salvador should seek to strengthen and sustain social ties, collective action and civic participation in order to address crime and violence at the community level, combining presence of the state and high levels of participation from the communities. Initiatives to promote crime and violence prevention at the community level should include actions to address the level of social ties within the community, and focus on encouraging higher levels of ‘willingness to act’ towards a common goal through the solution of community problems. The particular conditions and dynamics of each community should be taken into consideration when drafting a Community Based Crime Prevention initiative in order to produce the expected results, based on the needs and problems recognized by each community and deliver the answers to address those problems. INFOGRAPHIC: Why do Nigerians feel less safe than Salvadorians?